Would you feel safer if all officers carried Tasers? The Taser in the UK: safety measure? Or bad idea? Imagine having two barbed fish hooks fired at you at high velocity. They strike you, slice through your clothes and then 50,000 volts of electricity courses unrelentingly through your feeble body. You lose control of all your muscles and you go down, semi-conscious and in pain. That's the Taser gun, for you. A weapon designed to immobilise dangerous crooks, without putting the lives of police officers and citizens in direct jeopardy. But despite being designed to serve and protect, the Taser has been linked to over 200 deaths in the USA. There have been three deaths linked to the use of the weapon in the last five weeks in Canada alone. And now police forces across the UK want to put them in the hands of non-firearms trained bobbies on the beat. The Metropolitan Police will start a trial in December, while other police forces in the UK are reportedly already doing it. This is causing a lot of worry for some. Because it seems even police officers who have been trained in the use of firearms are not trustworthy when it comes to electrocuting members of the public. Two years ago, a 34-year old man went into a diabetic coma on a London bus. He was found slumped in his seat clutching his rucksack. The police force, in their infinite wisdom, decided that he may be a suicide bomber. And instead of seeing if the comatose man was ok, they shot him twice with a Taser gun just to be sure that he wasn't going to blow them up. Similarly, in the US, a man was found writhing in agony while suffering from a drug overdose. And instead of getting him to hospital, the cops who found him shot him three times with their Taser weapons. He later died in hospital. Another US citizen was shot a total of six times by reckless officers. He died too. And another innocent man was shot a total of nine times by cops. Not surprisingly, he also died. In Iraq, US Marines mount Taser guns on the end of their M16 rifles. So is this a sign of things to come in the UK? Cindy Butts at the Metropolitan Police Authority says that the use of Taser guns in the UK is to be strictly monitored and that the matter had been considered at length. "Members raised legitimate concerns about broadening the use of Taser to routine policing," she said. "We remain worried about the message this sends out to London's communities about the escalation of confrontation and need further reassurance that vulnerable people... will not be adversely affected. "However, without the Met participating, this authority will be unable to influence a final decision about future use of the Taser. Consequently, we agreed that the Met participates in the trial with the following rider: I will lead an MPA working group, working with the Met to jointly monitor and evaluate the trial. "We want to move forward and influence the national debate. Our concerns have not gone away, nor have they been answered. We will monitor these areas rigorously and ensure that the experiences of London influence national policy for the good." 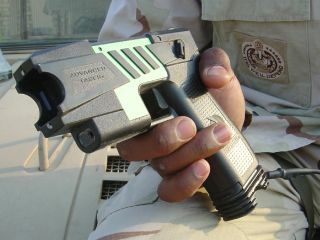 Taser guns were first employed in the US to cut down on firearms-related deaths. So you've got to wonder if, in the UK where most officers don't carry firearms, Tasers are really necessary. What do you think? Get in touch.